What if a bestselling author shared insider tips on how to promote your book? What if you had a road map that led you month-by-month through the essential steps to promoting your book? If you’ve written a book and don’t know how to spread the word…The Thrifty Author’s Guide to Launching Your Book Without Losing Your Mind is for you. The must-have resource for fiction or non-fiction authors who want to create an effective and affordable Internet marketing strategy. Written for busy people in a busy world, this book makes it easy to understand how to use the Web to build reader loyalty, increase author visibility and sell more books. The down-to-earth approach helps even those who may not consider themselves technologically savvy. Ms. Martin teaches you what’s required to create a website that works hard to increase sales and turn visitors into fans. 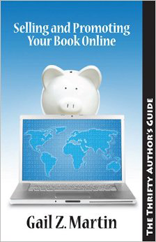 Whether you’re traditionally published, e-published or self-published, The Thrifty Author’s Guide to Selling and Promoting Your Book Online is the quintessential road map for using the Internet to promote your book around the clock and around the world. Discover the secret to using Facebook, Twitter, Pinterest and LinkedIn to find your book’s ideal readers, plus a world of online sites just for readers and authors. 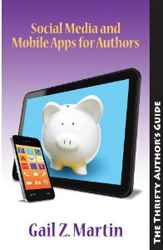 Written for authors by a bestselling author, this book spills the insider tips, tricks and techniques that can put your book at the top of the charts—plus find out about mobile apps to make writing easier and more productive! Just 30 minutes a day for 30 days can create social media marketing tied directly to achieving business results. 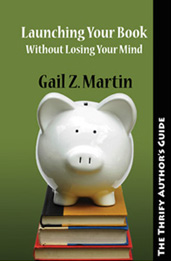 Marketing expert, bestselling author and international speaker Gail Z. Martin shows you how. Use this day-by-day, hands-on how-to program to shift your social media marketing into high gear in just 30 days! Just 30 minutes a day for 30 days can create online PR and marketing tied directly to achieving business results. Marketing expert, bestselling author and international speaker Gail Z. Martin shows you how. 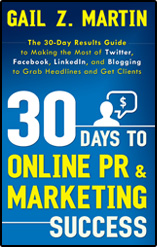 Use this day-by-day, hands-on how-to program to shift your online PR and marketing into high gear in just 30 days! Get MORE done when you’re out of the office or on the road. Find MORE productive hours in the day by making the most of “waiting” time. Enjoy MORE of your business or vacation travel with tips, tricks and apps that help you make the most of your journey. Make MORE money, connect with MORE valuable contacts and grow your business MORE quickly with the secrets to Virtual Productivity. 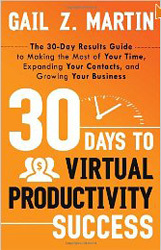 30 Days to Virtual Productivity Success is the busy business owner’s guide for getting MORE done in LESS time, making productive contacts online and using the power of the Internet to turn productivity into profits. It’s an easy-to-read, quick-to-implement recipe for online and on-the-go success. 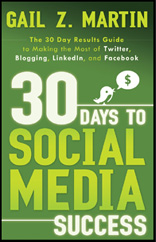 "30 Days to Social Media Success. Is it possible? I wouldn't have thought so until I read Gail Martin's astonishing little book. I love it! 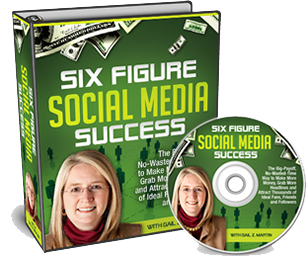 She shows you how, in just 30 minutes a day for 30 days, you too can be a social media success story. Highly recommended." This read is a must- for every business owner! "Anyone wishing to expertly grow their business by properly applying social media must read this book. Gail Martin holds nothing back and shares everything she knows to help you expertly move forward in today's world. This read is a must- for every business owner! who desires even greater success." "Gail Martin's 30 Days to Social Media Success really nails what you need to know to get free publicity from sites like Twitter, Facebook and LinkedIn. She's spelled it out in a short, easy format for busy people, so there's no excuse for not getting your social media marketing in gear. Best of all, this book explains how to use social media to build your business and how to contribute value to the online community. It's a must-read for any serious business owner." --Nancie Freitas, Chief Marketing Officer, Constant Contact, Inc.
“I can tell you that Gail Martin has her finger on the small business pulse. I love 30 Days to Online Marketing and PR Success, because it clearly articulates what small businesses need to know to grasp essential Internet marketing ideas and quickly put them into action. It shows you how to incorporate techniques like email marketing with other tools, such as social media marketing, mobile advertising, online PR and search engine optimization, to help your organization succeed. If you want a step-by-step guide to getting started with online marketing, this is the book for you.” --Nancie Freitas, Chief Marketing Officer, Constant Contact, Inc. Awesome book I highly recommend! One word describes this book (30 Days to Virtual Productivity Success)….WOW!